The BGO robot imaged HR 8025 for me. 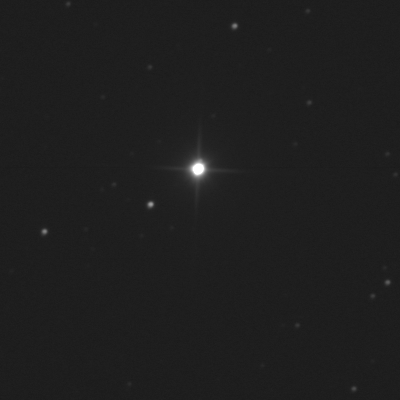 A double star in Cygnus. I wanted to revisit this target as I had not been able to split out the B star. Do you see it?! There's a faint little blip at the 1 o'clock position? Just to the right of the diffraction spike? Nutty! According to SkyTools, A is 5.83 and B is 13.5. They are 7.3" apart. And the PA is 348° (as of 1934!). Very nutty. The Washington Double Star database has some more recent data, from 2000. The first measure, from 1888, shows the separation (rho) was 6.9 with a position angle (theta) of 344. In 2000, the sep. was 7.1 and PA was 350. Interesting... The magnitudes are in agreement. Processed in colour on 10 Apr '18.